it’s been a few weeks, so it’s time to check in at the Disneyland Resort to see the multitude of projects currently in process. Most will culminate toward the opening of Star Wars: Galaxy’s Edge, and a couple will extend past that. But there is a ton of work happening, and so little time to cover it all. Lets race through it, shall we? 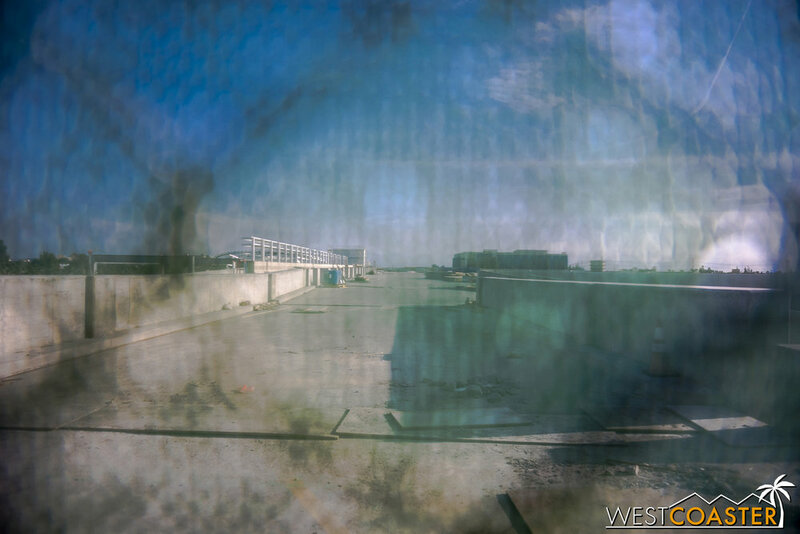 Work continues on the parking structure expansion, with the construction appearing to shift focus toward more architectural portions. The big canopy topper over the escalator promenade has been lifted into place—presenting a great “weenie” at the intersection of Disneyland Drive and Magic Way, and the planter framing has been anchored to the side of the structure facing Disneyland Drive. 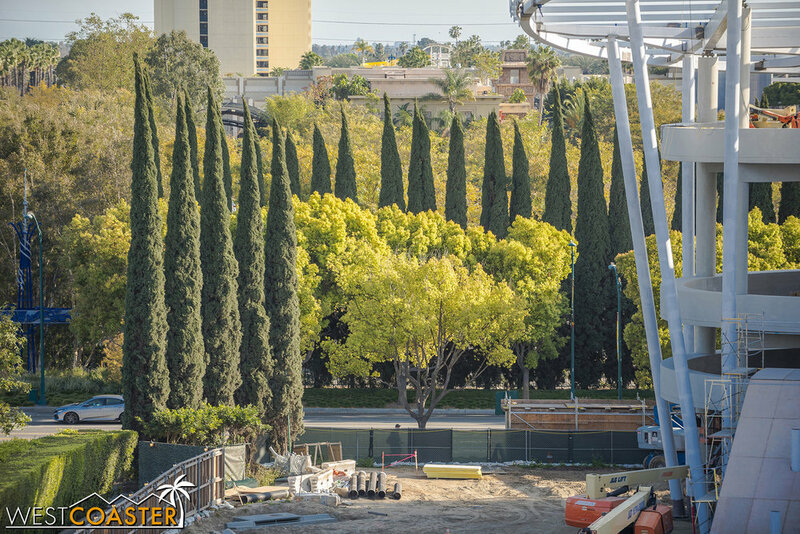 As one drives along, the mimicry of the new structure to the old provides a nice continuity and also suggests that this structure will probably be identified as part of the Mickey and Friends parking structure, just with new characters on the new portion. UPDATE: The new structure has officially been named the Pixar Pals structure. 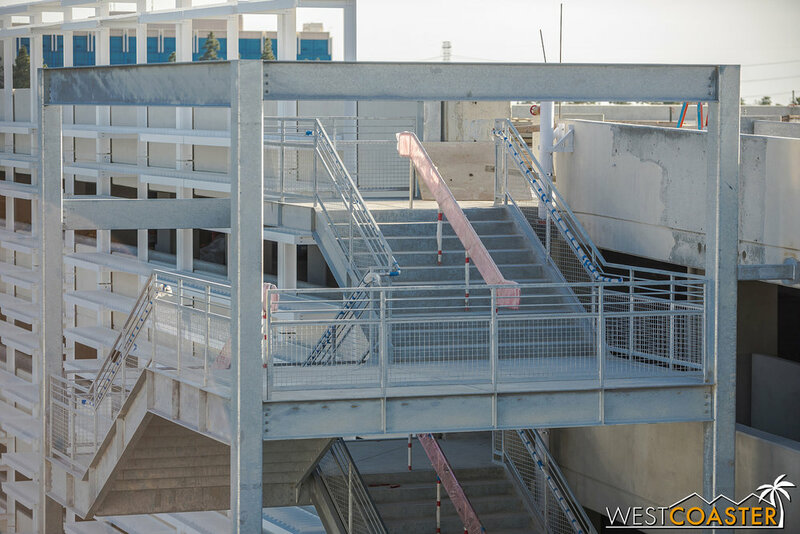 Other details, like progress on the escalators, stairwells, and building finishes, continue to advance. What does seem to be missing are any signs of the bridge over Magic Way that is supposed to connect pedestrians directly to Downtown Disney without waiting at a stop light, as well as a large canopy shown to be extending eastward from the long facade of the expansion structure. 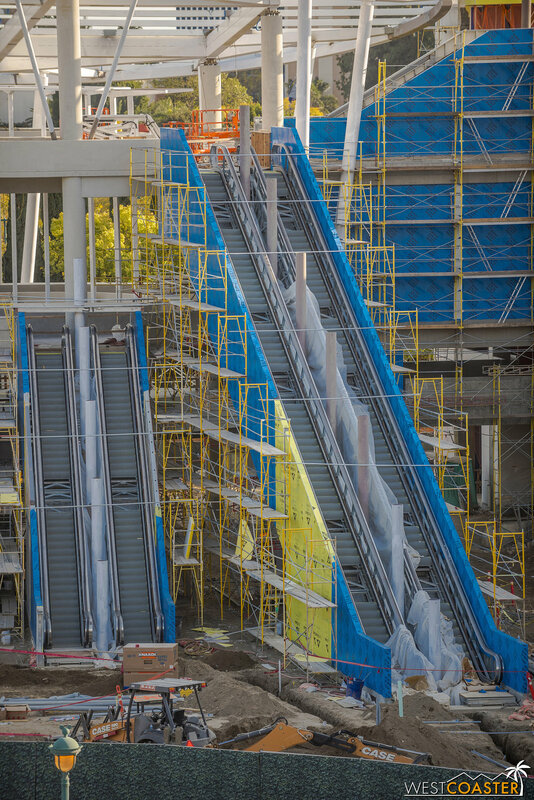 The escalator promenade still has a gap for where the bridge is to be connected, so one would assume that’s still in the plans. But it’s possible that the canopy has been value engineered out of the project since the rendering was published. 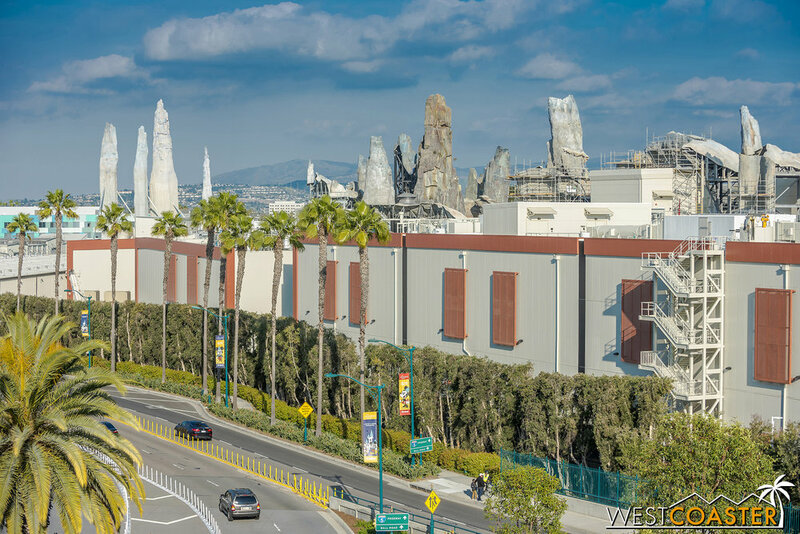 Here’s a view we haven’t really featured before… the parking structure expansion, as viewed from Disneyland Drive. From our usual overview, you can see the architecture is starting to come along. They’ve installed the planter box framing that runs along the east facade. And over the past couple of weeks, they also hoisted the big canopy to the top of the escalator promenade! The steel framing is in place for the canopy. They still have to frame intermediate and perimeter members, plus add the architectural finishes. The escalators continue along. Sheathing has been installed, with metal panel next (unless they’re reducing cost and using smooth plaster—more on that in a moment). The elevator towers are being wrapped up. Over in the existing structure, the building material is an aluminum composite metal panel. But here, it looks like they’re using plaster (stucco) with joints to mimic the panel look! They’re also setting up formwork to pour planters. You may recall that planters used to be here at the tram loading area. The escalator promenade looks like a UFO has landed on it. More exterior sheathing is being installed along the soffit and ceiling of the first level to allow for more cladding. 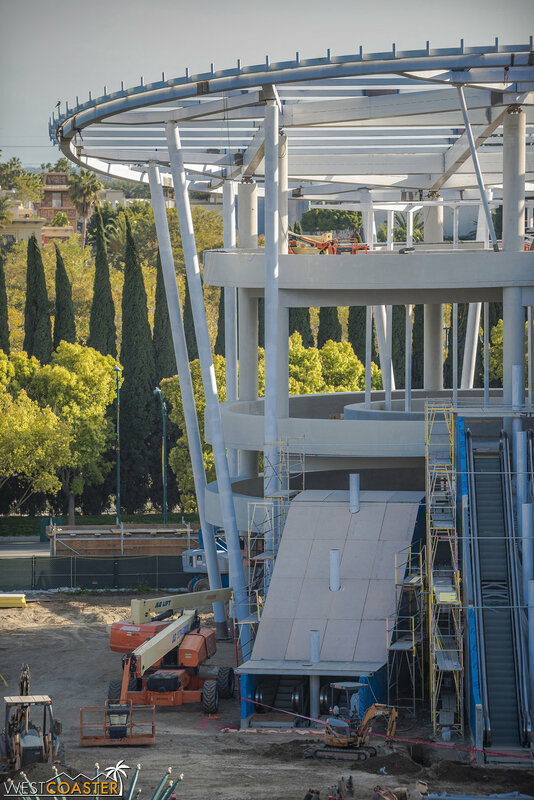 Another thing I noticed… the stairs over here are twice as wide as the typical stairs at the current parking structure! Close-up’s of the planter box framing. This is also a fun photographic composition. 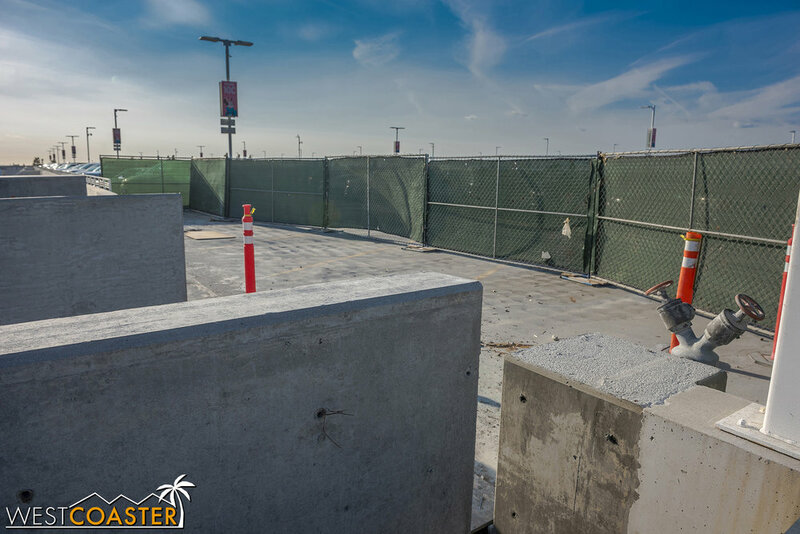 Gazing across the top level, these concrete plinths have been cast as part of pedestrian barrier protection. The rest of the top floor looks like it’s had its concrete work largely complete. This gap between the bridge connecting the new structure to the old and the existing deck will be filled in with an expansion joint to allow for movement between the two structures. It’s an earthquake accommodation thing. Drivers leaving the new structure will cross this bridge to connect back to the old structure. They’ll make a right turn toward the bottom left corner of this frame to continue exiting. Peeking into future oncoming traffic. This is the ramp up to the 5th and 6th levels. 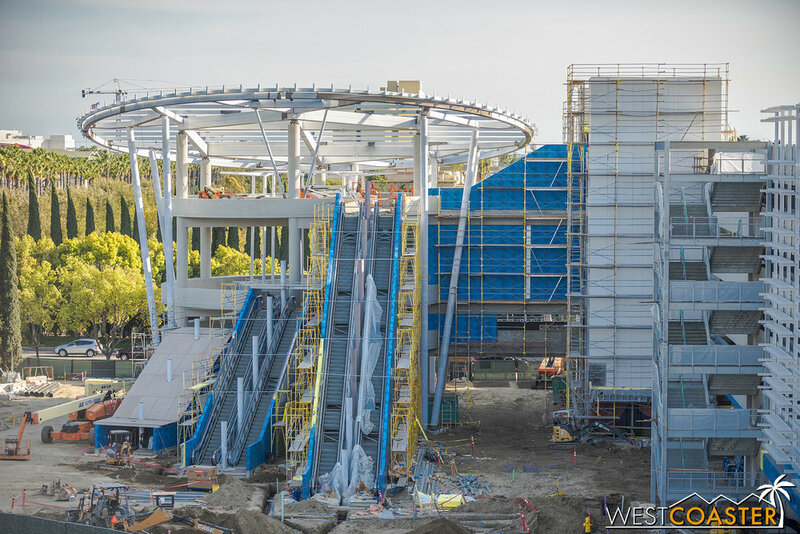 The added structure has its own set of ramps to its levels, to be accessed by turning left after the parking booths and heading toward where the bus and overflow parking used to be. But from what I’ve observed, there isn’t any dedicated series of exit ramps down from this structure. Everyone who parks on the new structure will need to drive back onto the old ones and loop around to the exit ramps there. 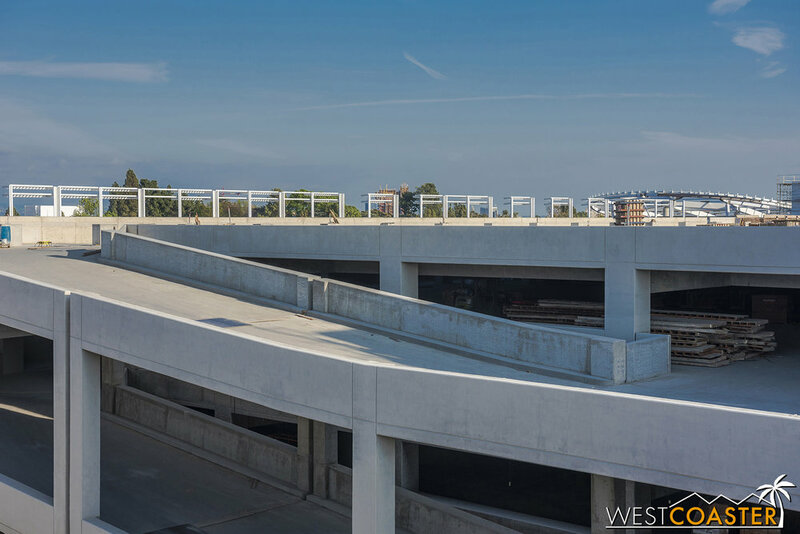 Will that create congestion on the parking structure? Yes. Especially during peak leaving hours. 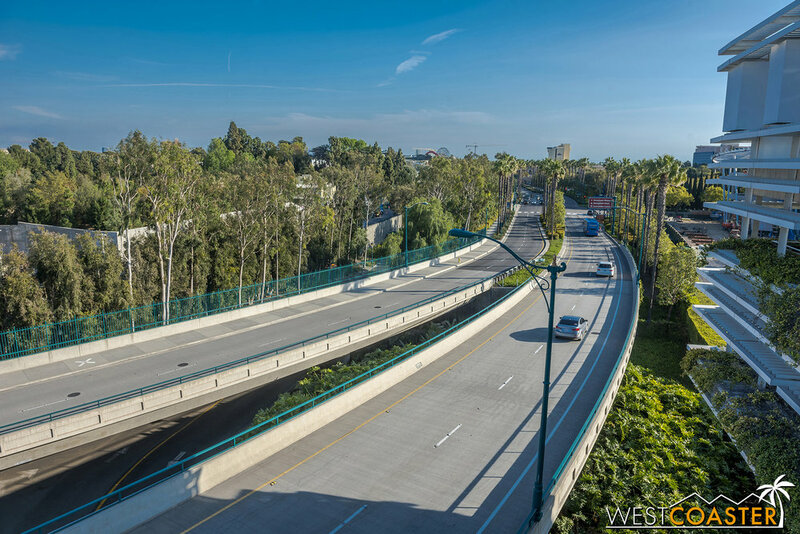 But better to back up traffic and contain it within the structure than add traffic on the streets by dumping new parking structure vehicles onto Magic Way. Another view at the bridge that will take vehicles back to the existing structure on the left. Lets check out the escalator promenade from ground level. I like that this is all rounded. It’s a nice difference. 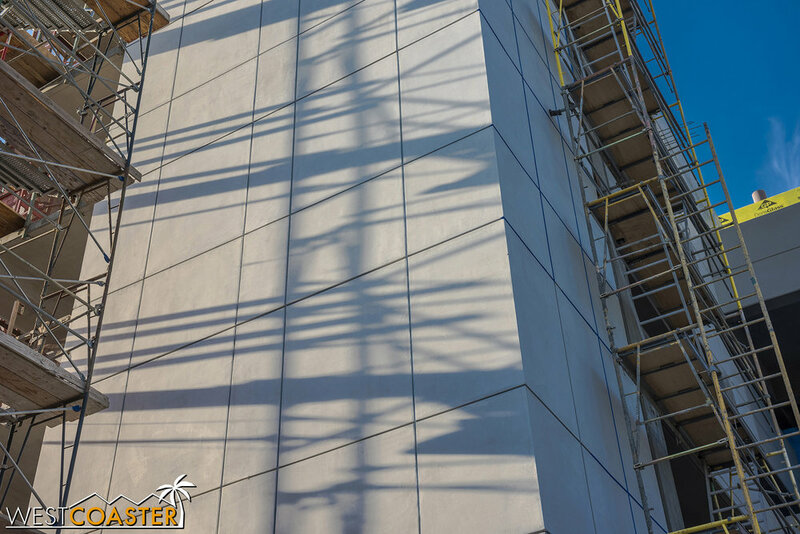 Here’s a close-up at the plaster finish of the elevator towers, instead of the metal panel finish that the current structure has. Money cuts! Still no sign of tree clearing required to install the skyway bridge across Magic Way. Nope, none at all. So it doesn’t look like the bridge will be built before the structure opens. But the structure is running along. And it looks like it will open comfortably ahead of the Galaxy’s Edge opening date. UPDATE: I was way off in my estimation. Disney officials have said it will open by early July, maybe late June. In Downtown Disney, work continues at the old ESPN Zone building in preparation for the upcoming Pop-Up Disney!—A Mickey Celebration attraction that will be opening Friday, April 26. This Instagram-geared attraction follows the fad of many recent limited-time pop-up events, providing photo ops for Disney fans to share on social media. Tickets are on sale now for this. Meanwhile, over at the center of Downtown Disney, Black Taps continues to plod along. 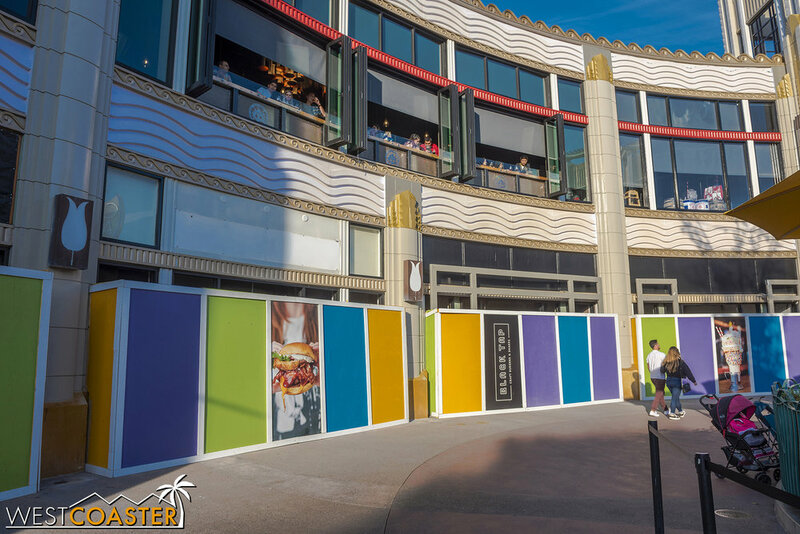 We’ve now come to the point where it may be a legitimate endeavor to wager on whether Ballast Point’s future, ground floor neighbor will open before or after Star Wars: Galaxy’s Edge! There’s certainly lots of work going on inside, but there’s been little exterior progress visible since our last check-in a few weeks ago. The Pop-Up Disney! exhibit will open the last Friday of next month here at the old ESPN Zone site at the west entrance of Downtown Disney. Black Taps continues to progress. Hard to tell, but the wall panels above the storefronts have been getting updated. Which will open first? Black Taps, or Galaxy’s Edge? 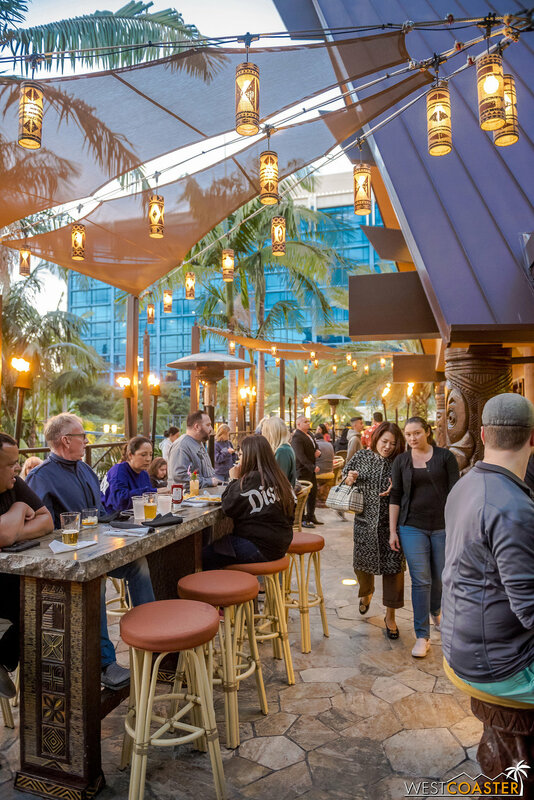 Another recent restaurant renovation we missed was the reopening of Tangaroa Terrace, located next to Trader Sam’s Enchanted Tiki Bar in the Disneyland Hotel area. 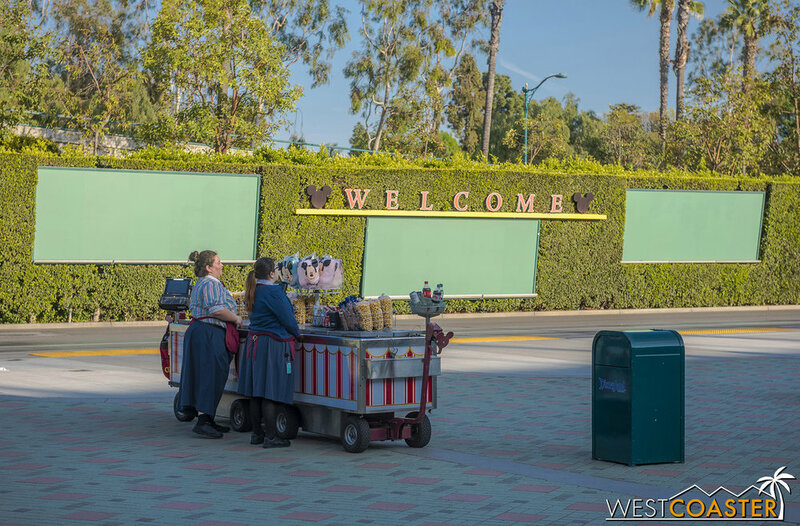 This quick serve was revamped and outfitted with an additional bar area and Dole Whip booth. Guests can still order food inside to the left (though the automated machines have been taken away), and the seating area remains around the establishment. But its use as a watering hole has been expanded with the bar addition, and the Dole Whip addition also means that guests can order alcoholic Dole Float—previously only available at the little bakery/cafe next to Goofy’s Kitchen nearby! 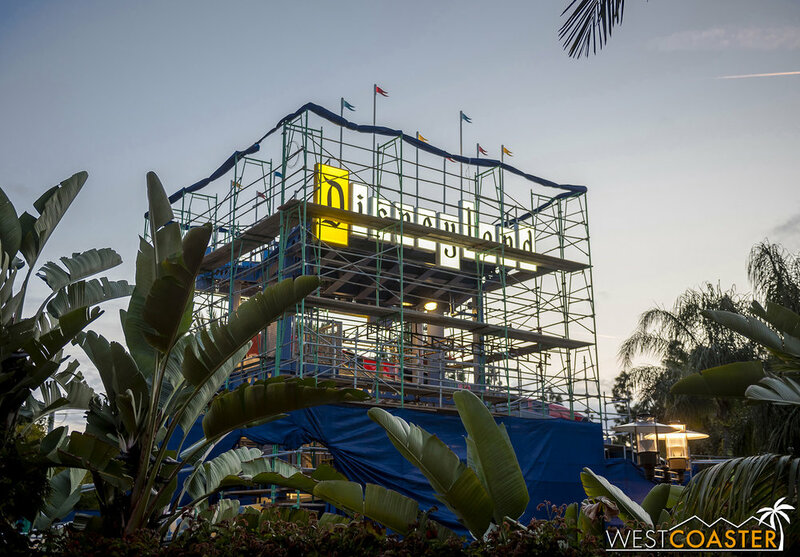 Tangaroa Terrace has attracted some good crowds since its reopening early last month. The outdoor area has been reworked a bit with the addition of a bar. it’s really cute. I love the overhead shading and lanterns. A band plays on evenings. Inside the restaurant, where patrons can order. No more self-ordering kiosks! Cast members will take orders again. Pick-up window for food here. And here’s the added bar. Part of the menu—the most important part. It looks pretty neat! The renovation brings an even more attractive vibe to this corner of the Disneyland Hotel grounds! 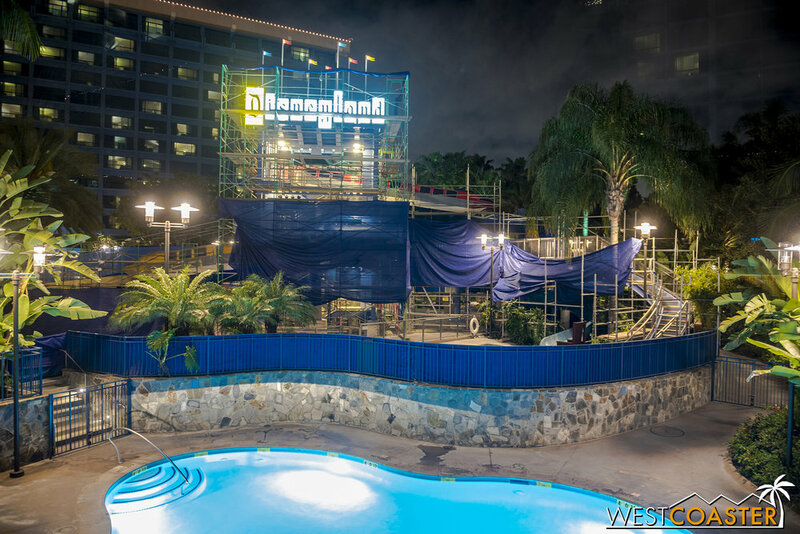 Also, the water slide at the Disneyland Hotel has been under refurbishment the past couple of months. I think this might be its first major rework since it opened several years ago. The E-Ticket and D-Ticket pools beside remain open to hotel guests, though. Please find water slides elsewhere. Speaking of Disney hotel work, the cabana structures next to the Grand Californian’s pool continue to progress. Light gauge framing is now outlining some clear structure. The project should be complete this summer. The cabanas are coming along at the Grand. This tabebuia tree is blooming. Still a bit to go, but they’re working on this. Over at Pixar Pier, Jessie’s Critter Carousel had progressed to the point where it was testing last Friday. It looks to be on track to open next month (or maybe even this weekend if early?). Jessie continues to creep over the work walls to eye your soul, and she’s been joined by a cute cactus piece supporting the attraction signage. 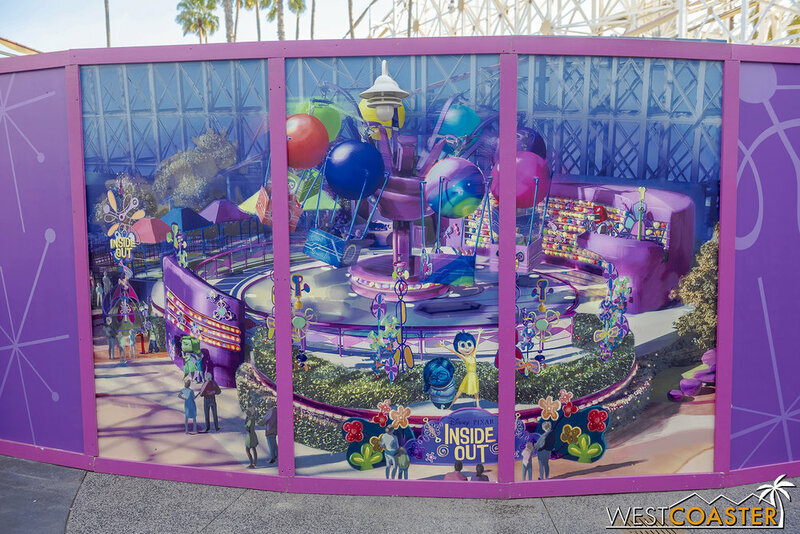 Over at the site of Inside Out: Emotional Whirlwind… a whole lot of nothing! Though they have added an enlarged rendering of the ride. I mean Jessie’s Critter Carousel. They were testing the carousel too, last week. We should see these work walls come down soon, right? New at Inside Out… absolutely nothing!! Except they adding metal coping along the parapet of the dispatch booth, and they painted it purple? They’ve also added an enlargement of the rendering of the ride. Also, Silly Symphony Swings is currently down for refurbishment. It’s shown to be closed at least through May 8th, the furthest out the day-to-day Disneyland Resort calendar currently stretches. The entire ride structure has been disassembled, much like the Astro Orbitor’s was, so this is not a quick bit of TLC. It’s pretty out of commission for a little while for this refurb. Also, here’s proof that World of Color is back! Not much more progress visible since last time at the land of Marvel. The exterior demolition work of the It’s Tough to Be a Bug theater seems to be slowly moving along, but there’s nothing too exciting to see. So I had every intention to get new angles of Marvel Land by going up the Pixar Pal-A-Round to photograph aerially. 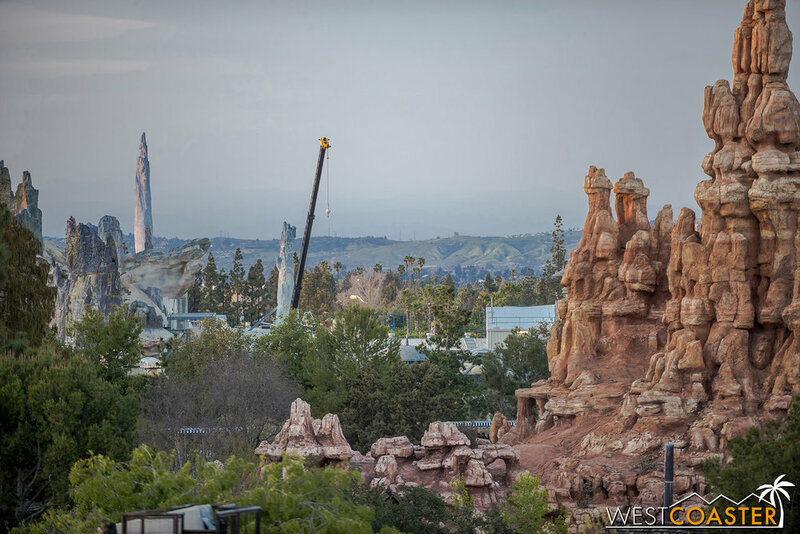 I hadn’t gone up there since the Cars Land construction update photography days. When Cars Land opened, Dan and I swore we’d never ride the ferris wheel again. Well, the line last weekend was 45-60 minutes. So I still didn’t go. You get these near-repeat images of Marvel Land from last time instead. Grizzly River Run has been refilled with water and was testing last weekend. It will reopen this Friday. 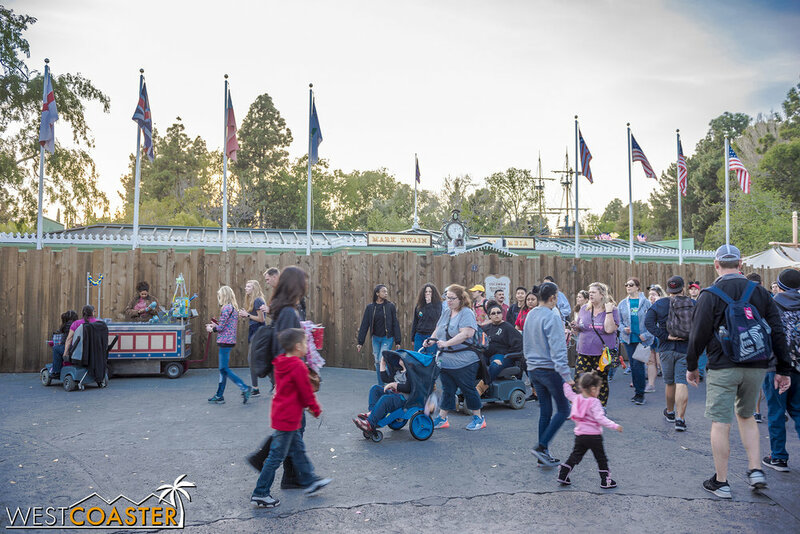 And in other good news, sometime over the past few weeks, the park came to their senses and moved the smoking area next to the Grizzly River Run lift hill over to the Silly Symphony Swings. This is great news for the poor cast members at the Golden Dreams Food & Wine Festival booth, who had been dealing with secondhand smoke waving over regularly. And to have this next to a food serving area was pretty surprising, to say the least! GRR is cycling rafts. It’ll be reopen in a couple of days! They’ve moved the smoking area away from the Golden Dreams food booth. Because, seriously, who thought it was a good idea to put a bunch of smokers next to a booth that serves food and drink??? Lastly in DCA, Captain Marvel has arrived with her own meet-and-greet in Hollywood Land. Over at the far end of the land, a hangar and protruding F-15 fighter jet has emerged, providing a dramatic backdrop for the newest Avenger to been unveiled. It’s been a pretty popular meet-and-greet thusfar, no doubt due to the movie’s success. Something flashy has arrived in Hollywood Land. No, actually, a fighter jet! Well, half a fighter jet. And also a new superhero. It’s Captain Marvel! Just ignore her wig. Those aren’t Kree specialties. The plane is pretty cool, though, as is the photo op. Springtime renovations continue at Disneyland, with Sleeping Beauty’s Castle, the Astro Orbitor, and parts of Frontierland and New Orleans Square getting work. Springtime blooms have also finally come to The Hub, after all the rains we got over the winter. It looks nice, though the tabebuia trees aren’t blooming simultaneously this year. It’s just a bit of a shame that the castle is covered up and detracting from a complete composition. They’re still working on the castle re-roofing. But springtime is finally (and at the actually appropriate time) blossoming. Always love those pink blooms. The work walls have been adjusted a bit to block the entrance into Fantasy Faire. The lane from the Frontierland entrance must be used instead. The Astro Orbitor is back together! 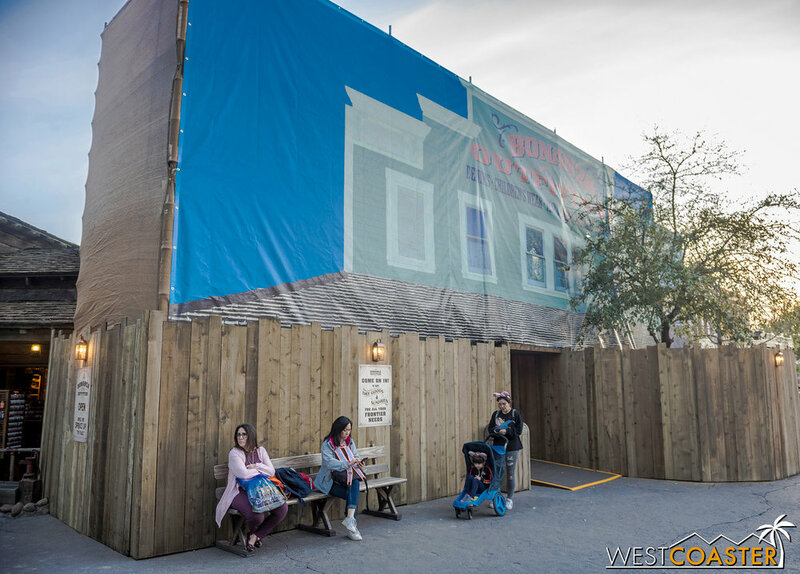 Some of the facades in Frontierland are getting repainted. Little maintenance projects like this are always needed. Frontier Landing remains open during its refurbishment. And a bit of work is going on at this planter in New Orleans Square. So lots of little beautification projects going on throughout the park to get things spruced up in line with the opening of Star Wars: Galaxy’s Edge! Finally, the big news since we last checked in with “Star Wars” Land is that Batuu finally has an opening date! Friday, May 31 is the big day when Galaxy’s Edge debuts to what is sure to be a ravenous and overwhelming crowd. The reveal won’t be exactly complete, however. Star Wars: Rise of the Resistance will not be operational when the land opens, though Millennium Falcon: Smugglers Run and all shops and restaurants will be. In addition, admission to the land—though free—will require reservations. I’m guessing they’ll implement a FastPass style system, perhaps accessed via the Disneyland app. Guests staying on Disney property will automatically receive a reservation, though there’s no guarantee on what time that reservation will be. In addition, initially, the Millennium Falcon ride will not have FastPass, in order to keep the queue moving along as fluidly and continuously as possible. The phased roll-out is intended to ease crowds into things. I would guess that Rise of the Resistance will open in June—possibly after Annual Passholder blockouts kick in toward the end of the month. But opening the land early (it was originally officially announced for a June opening) functions as a sort of soft opening to get things running. Undoubtedly, Friday, May 31 will be a zoo at Disneyland, and probably the Resort as a whole, as the crowds will also bring with them traffic congestion on the streets as well. So finishing touches are being placed on the rocks. Mostly painting and filling in gaps. It’s kind of funny to see where things go down and what’s seen from certain angles that shouldn’t be seen (but fortunately is not seen from the park). It appears that this exposed structure will remain exposed? Although other back parts have gotten some cover panels. 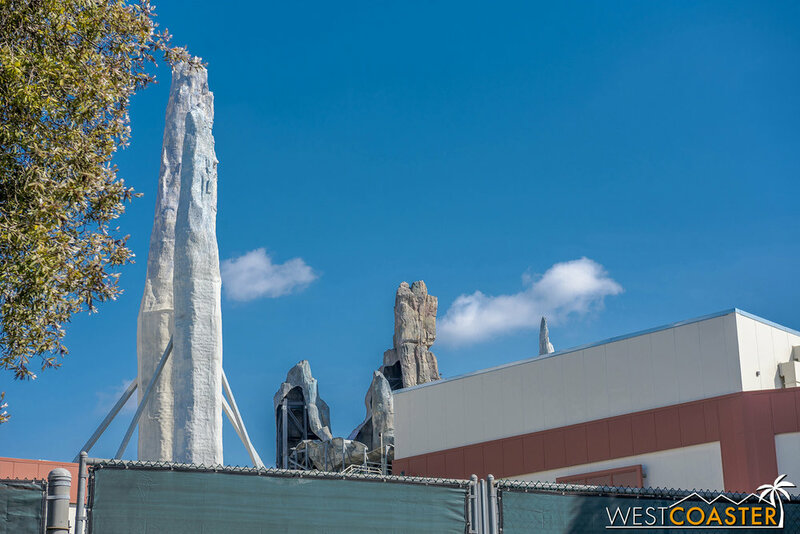 They’re finishing up the rockwork over at the Rise of the Resistance side of things. The mechanical area looks to be up and running. Funny observation… they’ve added these black stripes across multiple points of the facade. This looks like an attempt to make the band recede and break the massive building down into smaller parts. Millennium Falcon building from Disneyland Drive. It’s a constant pet peeve that viewlines of Disney attractions aren’t considered as important outside the park but still on property. I don’t mean that the buildings should be covered on all sides, but not seeing the steel structure and bracing would have been nice. It’s still an impressive sight from the street, though. You can see that black banding from this angle, breaking the building into modules so as not to seem quite as massive. We’ll close out with some views from Tarzan’s Treehouse. I do love how these spires integrate with the Frontierland skyline. It works every bit as I imagined. That does it for this update—our final Disney update of the month. It’s a little crazy to think that in two months, the Disneyland Resort as we know it will be changed forever, as Disneyland welcomes a galaxy far, far away. The Black Spire Outpost will be amazing, and this summer is sure to be packed to unprecedented capacity as the hype works its way through. It’s definitely going to be interesting to observe, but we’ll do our best bring comprehensive updates!